Australia is big… so big in fact that it’s not only a country but a continent as well (ok, so as a continent that also includes New Zealand and many Pacific Islands but you get the idea.) So what does a big country need? Some completely random Big Things, that’s what! The Australian Big Things are a strange phenomenon and it’s thought there are around 150 in total. 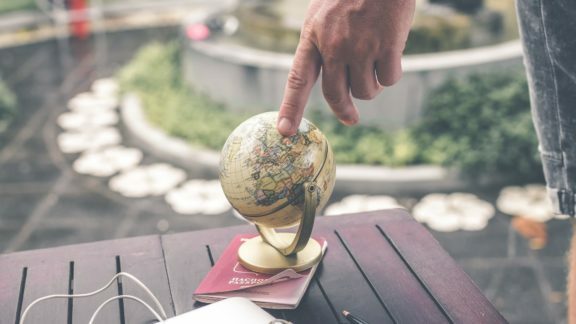 It’s highly likely that you’ll stumble across one or two during your trip around the country. 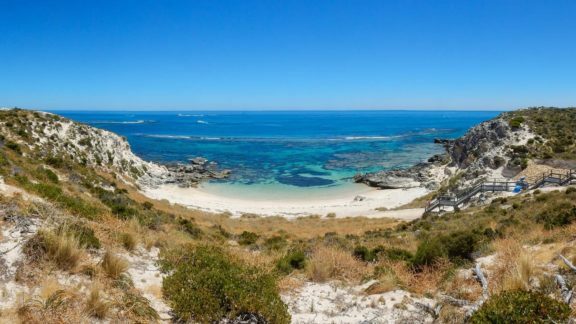 Some people organise road trips to tour Australia’s Big Things, so here’s a list of them, in case you feel like doing that as well! I haven’t included all of them, because frankly, some are a bit rubbish. On the list first because it’s often claimed to be the first big thing that appeared. (It’s certainly been there since 1964 anyway). 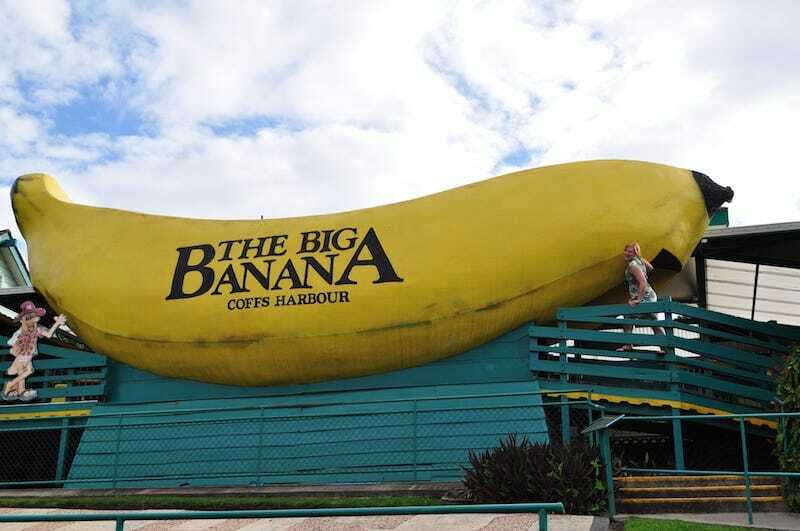 You’ll find the Big Banana in Coffs Harbour, alongside the banana themed gift shop. You can also take a tour around the banana plantation or completely randomly, go indoor skiing! 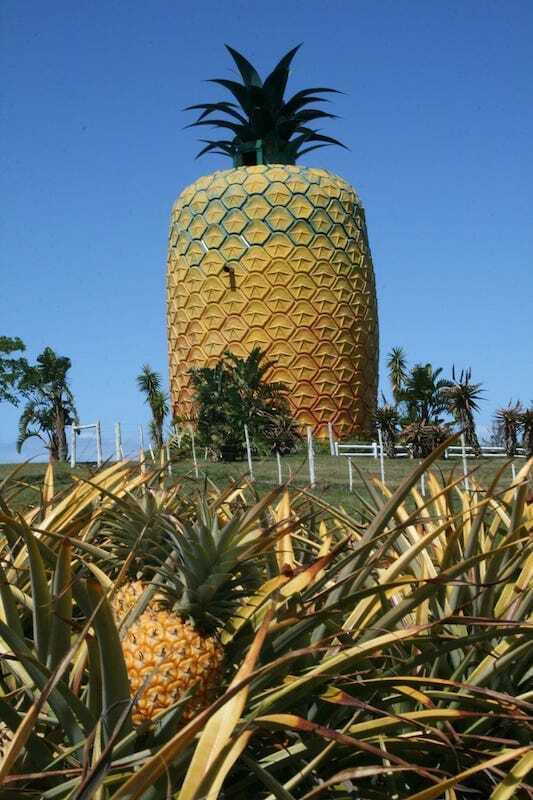 At one point, The Big Pineapple was Australia’s most popular tourist attraction, getting a million visitors a year. I’m not really sure how to feel about that! Possibly because of it’s past popularity it’s now a heritage listed site. You can apparently go inside the pineapple, then follow that excitement up with a trip on the Pineapple Train. The train takes you through the plantation and rainforest and takes you back to the station where you can visit the Pineapple Cafe. The site has actually expanded quite a lot over the years and there’s even a zoo onsite now and markets every Saturday. One of the newer Big Things, Bowens 10 metre high Mango was erected in 2002. It was stolen once as part of a publicity stunt, but thankfully was returned! Nando’s, the chicken company who stole it, even donated a Mini Mango which was 6 metres tall to say sorry. 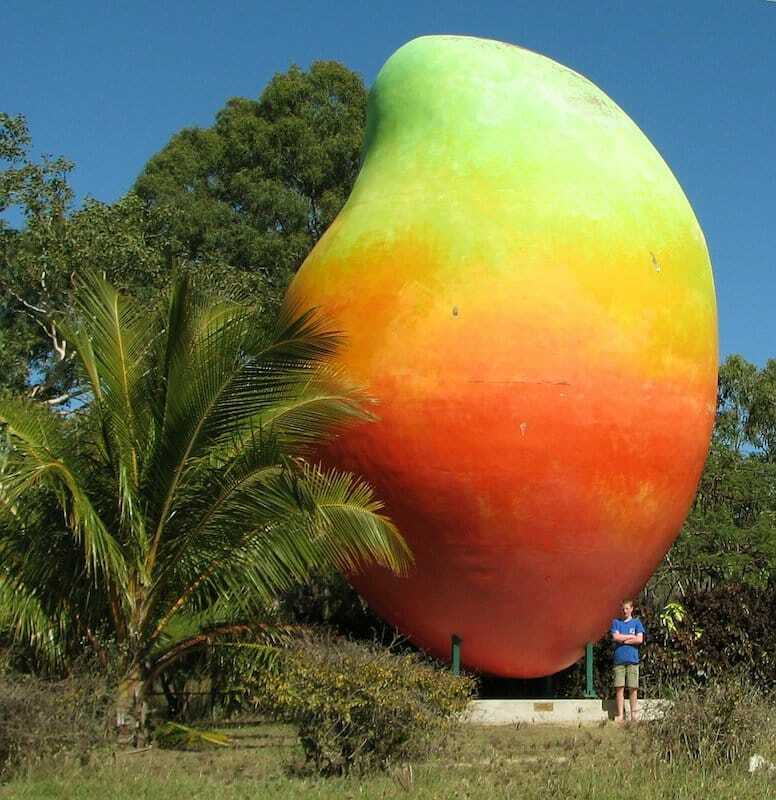 Bowen is famous for delicious Mangoes, so make sure you try some while visiting. 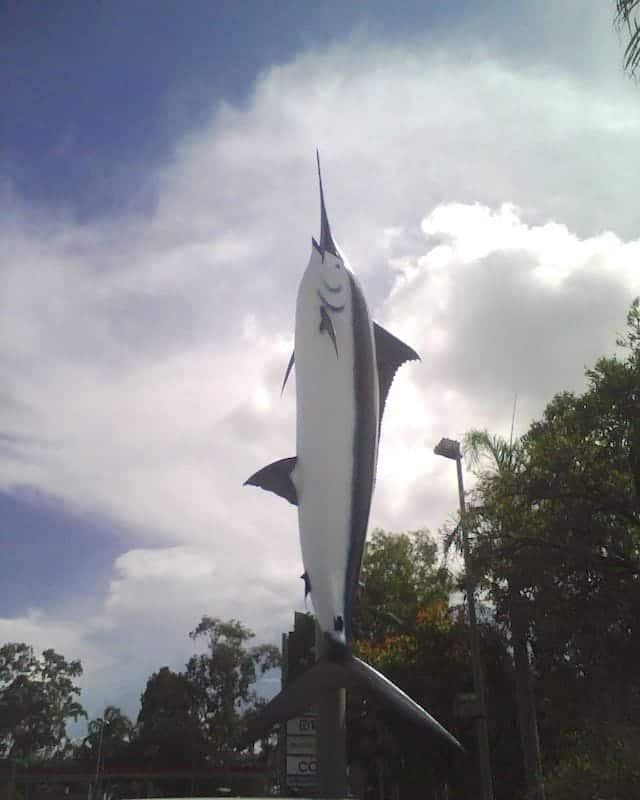 In Cairns you can find the Big Marlin. It’s here because the first 1000 pound black Marlin ever caught in the world was caught off the coast of Cairns. The Big Prawn was originally built in 1989 but has recently undergone a much needed makeover. The makeover included giving it it’s missing tail. It’s now found outside Bunnings Warehouse, who paid for the restoration. 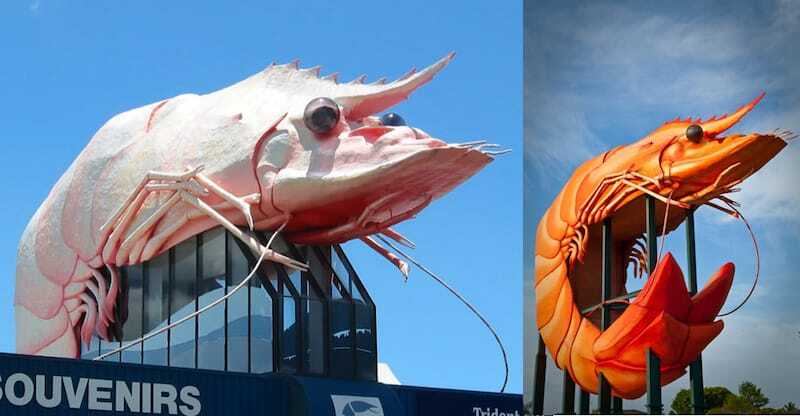 If you like seafood then after taking a selfie with this huge shrimp, visit one of the awesome seafood restaurants located close by. 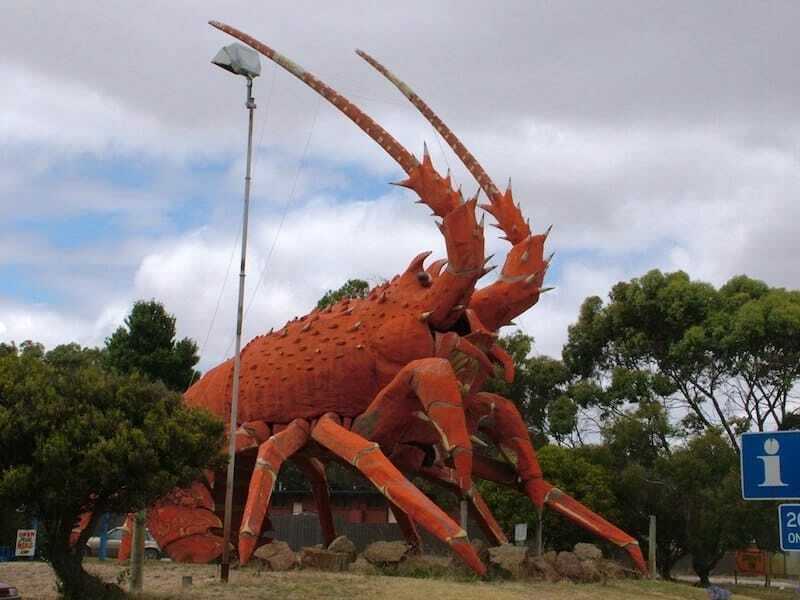 The Big Lobster is also known as Larry the Lobster by the locals. 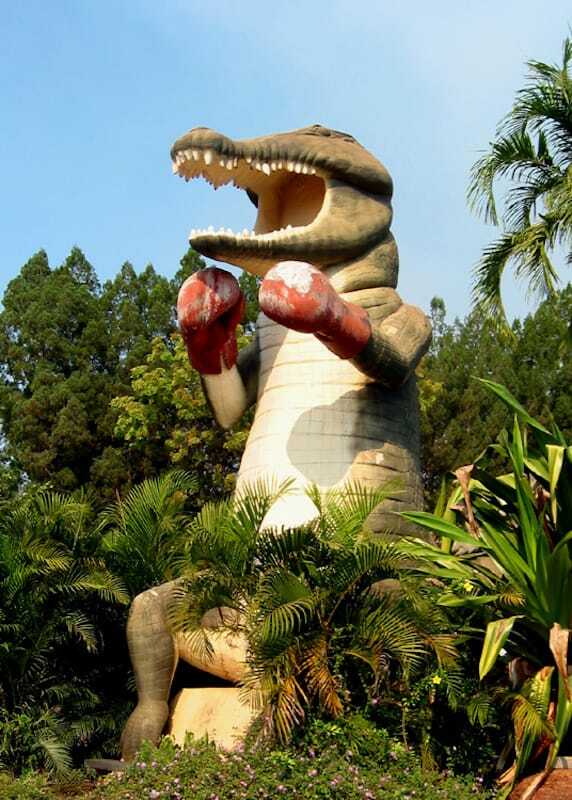 He was completed way back in 1979 and was originally created to attract attention to the restaurant and visitor centre on the site. Have a coffee, take a selfie, buy some overpriced souvenirs. That’s about it at the site of The Giant Koala. 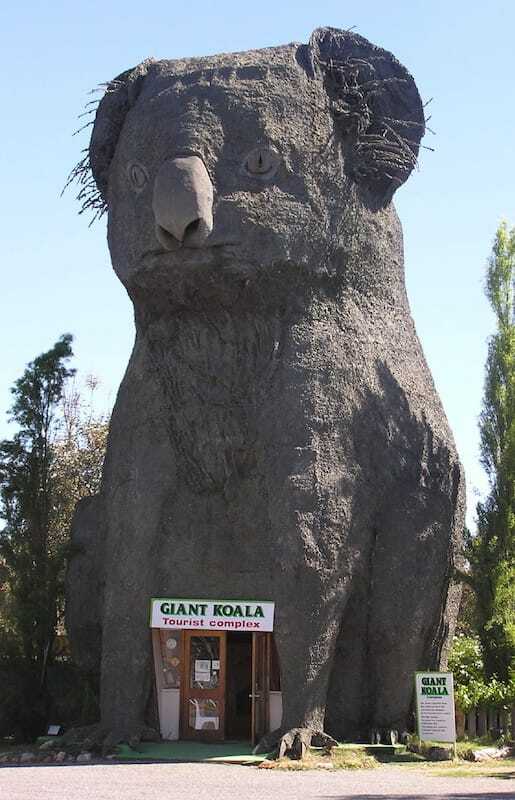 Yes it’s big, and at 14 metres tall is one of the biggest, but you might disappointed if you visit (most people seem to be according to the reviews)… Could it be that it’s quite a terrifying looking Koala? Worth stopping but not altering your route to see it by all accounts. Location: Western Highway, between Melbourne and Adelaide. Not impressed by The Giant Koala? 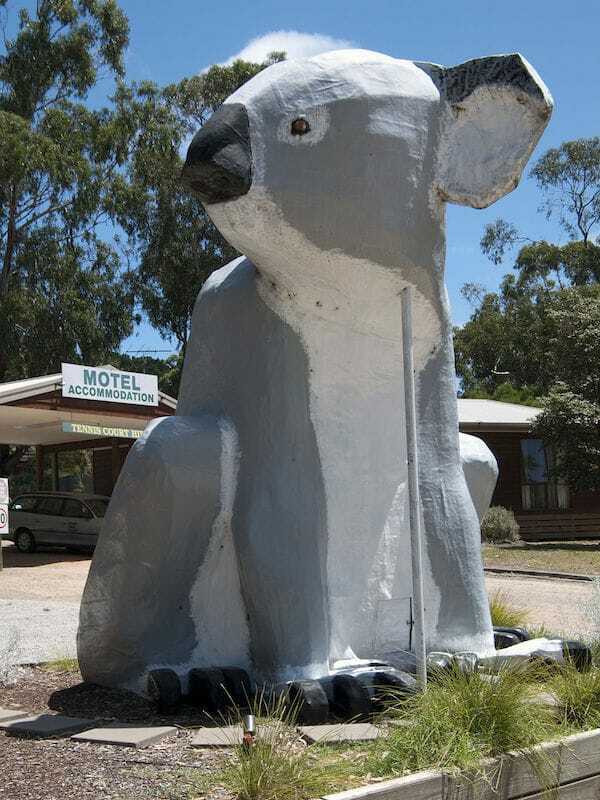 You’re better off visiting The Big Koala on Phillip Island Road instead. He’s much friendlier looking! 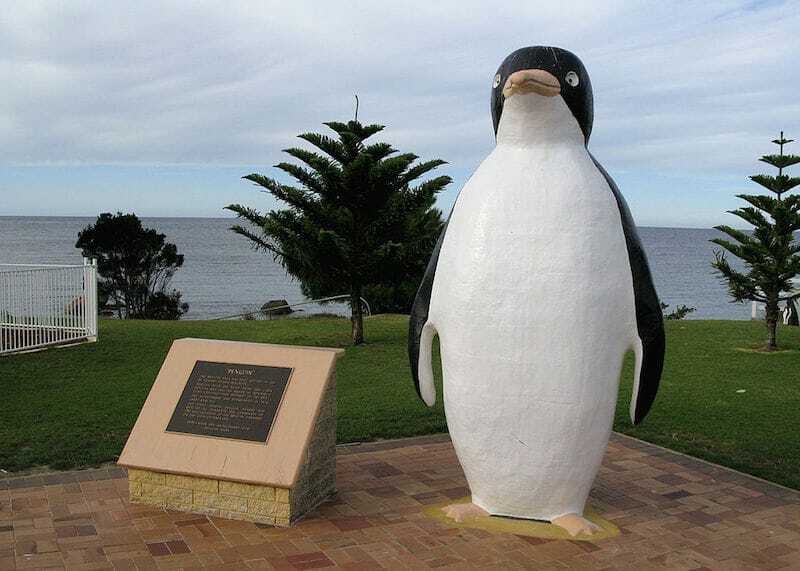 The Big Penguin is located in a town called, wait for it… Penguin! 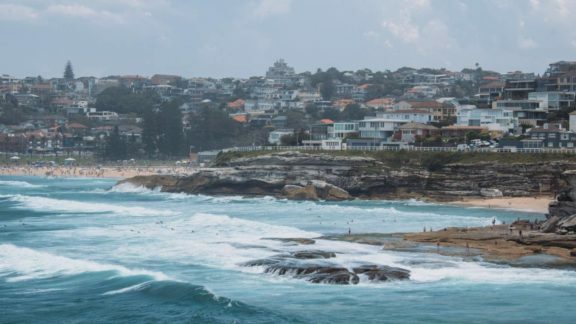 Named after the gorgeous little penguins which call the area home. (Read more about Aussie Animals). Penguin is well worth a visit as you’ll find lots of real and monumental penguins all over the town. 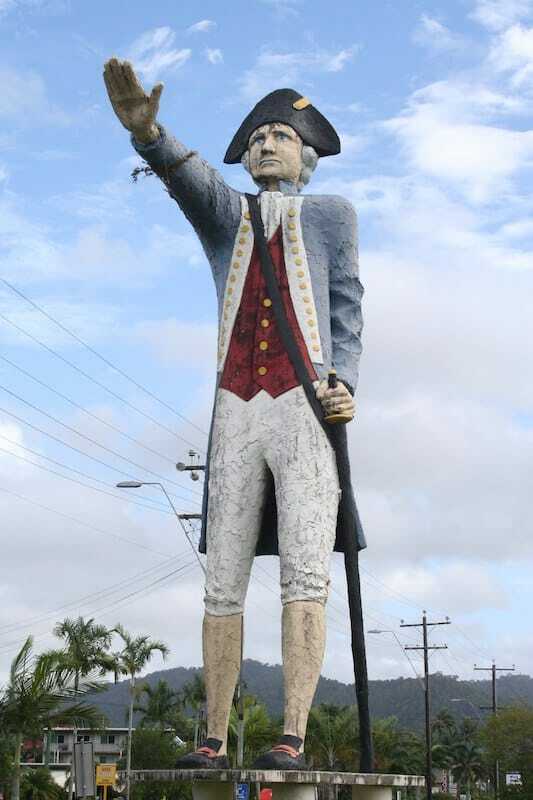 If you’ve been to Cairns you’ll have seen Captain Cook towering above the road. He appears to be telling you to stop, and he looks a bit stern, so maybe he’s asking you to adhere to the road rules? Who knows. 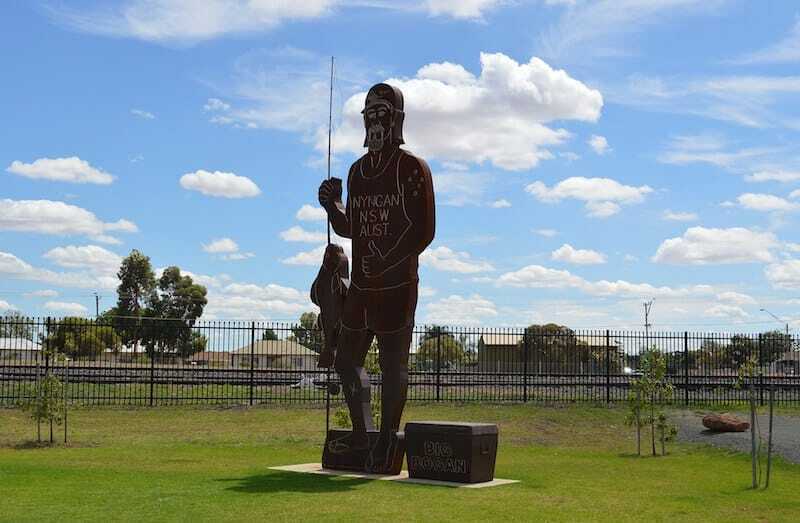 The Big Bogan was a bit controversial when it was proposed because the word Bogan is a bit of an insult (read more Aussie Slang terms), however Nyngan is the location of the Bogan River, Bogan Street and Bogan Way, so if a massive Bogan were to be constructed anywhere this does seem to be the most appropriate location for it. 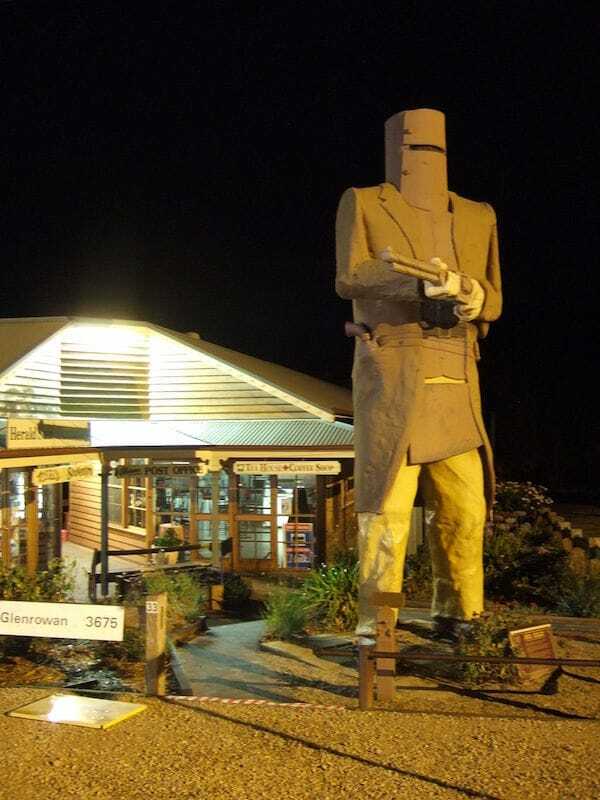 There are 2 Big Ned Kelly’s in Australia, but the one in Glenrowan is at least located where The Kelly Gang’s last stand was. Ned Kelly is the most infamous Australian, being a convicted police killer, a gang leader and an outlaw. Ned Kelly was also the son of John ‘Red’ Kelly, one of the most famous Australian convicts. 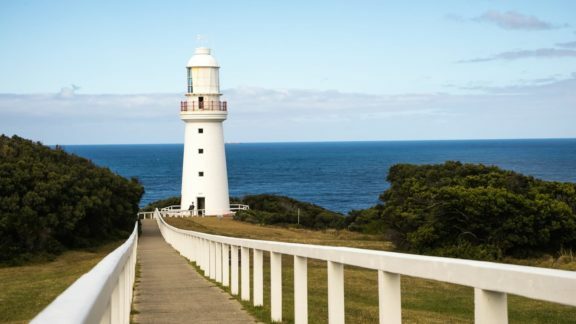 Which Australian Big Things have you seen or are planning to see? Or which ones should I add to the list and why?